When a shedder bar is placed in a flow, Karman vortices are generated on the downstream side of the bar. The Karman vortices are detected by two piezoelectric elements installed in the upper part of the shedder bar. The vortex frequency is proportional to the ow velocity in a specific range of Reynolds numbers. Therefore, flow velocity or flow rate can be determined by measuring vortex frequency. Noise caused by strong piping vibration may affect the accuracy of vortex frequency detection. The two piezoelectric elements in the digitalYEWFLO are installed in a configuration that is polarized, so they are not affected by vibration in the ow or vertical directions. The noise of vortex (lift)- direction vibration is reduced by adjusting the outputs of the piezoelectric elements. Combining these features with the Spectral Signal Processing (SSP) function provides optimum and stable measurement. When a spark or other ignition source ignites particulate in a vessel a fireball develops as material burns in grows at an exponential pace. The pressure front expands as the fireball grows reaching the explosion vent. The explosion vent opens at a specified pressure, limiting the stress on the vessel on allowing it to maintain structural integrity, while also releasing the pressure and allowing the fireball to vent into a safe area outside the facility. Alternatively, when the process can not be vented safely outside, the explosion vent opens and directs the fireball into a flameless venting device. the flames are extinguished as they pass through the flame arresting screens allowing pressure release, but preventing dangerous flames from entering the work area protecting personnel and preventing secondary explosions. It is also necessary to isolate the deflagration, preventing the transmission the flame into interconnected vessels. During a deflagration, the pressure wave from the explosion reaches the detector connected to the explosion protection control panel, which processes 4,000 data points per second. The system alarms at a preset pressure level and sends an activation signal to the isolation devices. 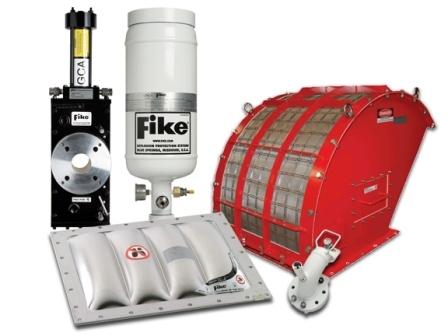 The system opens a rupture disk on isolation container that uses 500 psi of nitrogen to drive suppressant into the ductwork, providing a chemical isolation barrier that prevents the propagation of the explosion. the system maintains a history of the event for future reference. 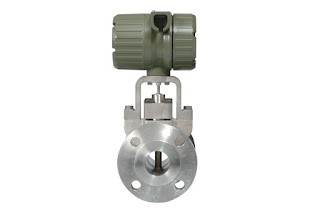 Simultaneously, the gas cartridge actuator drives the piston on the isolation valve, closing the slide gate, and provides mechanical isolation which prevents the propagation of the explosion through the duct work too interconnected vessels. The VM V-Cone System, manufactured by McCrometer, acts as its own flow conditioner, fully conditioning and mixing the flow prior to measurement. The key benefit to the VM V-Cone flow meter’s unique design is its ability to provide reliable system accuracy of +0.5% of rate over a 10:1 flow range under the most difficult flow conditions. Readings are precise and reliable, even under changing flow conditions and start/stop flows. Once installed, the primary element rarely, if ever, needs to be removed from service. This leaves only the flow transmitter with the occasional recalibration over its lifetime. The V-Cone family of flow meters have a proven long life with installations exceeding 20 years without the need to be removed or re-calibrated. 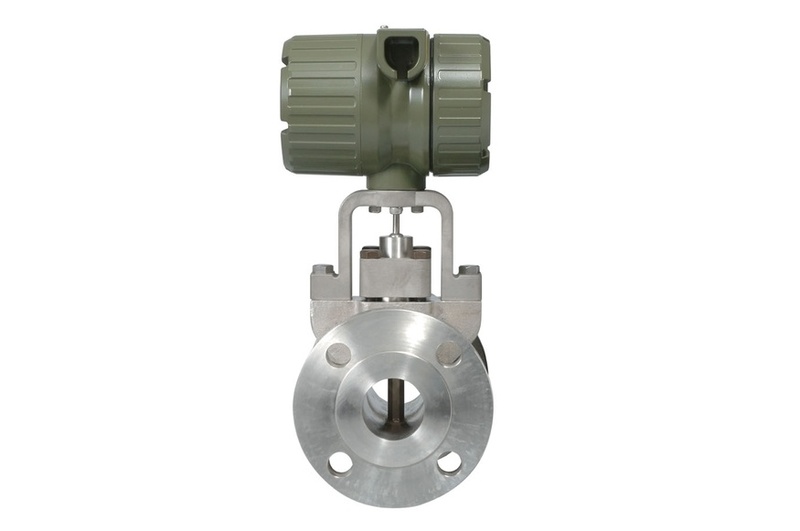 The VM V-Cone flow meter’s enhanced performance is due to the shape and positioning of the measuring element. 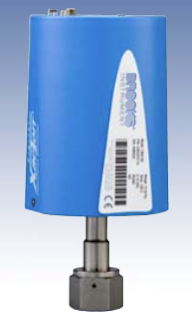 The VM V-Cone flow meter’s unique design centers the differential pressure cone centrally in the flow tube. This placement reshapes the flow profile, giving the V-Cone the smallest footprint of any in-line flow meter. This conditioned flow creates a low amplitude, high frequency signal that is accurate to ±0.5% of rate. 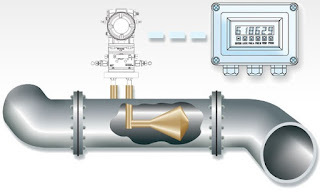 This video visually demonstrates the advantages of the V-Cone flow meter. Lyophilization, also known as cryodesiccation, or more commonly “freeze-drying” is a dehydration process typically used to preserve a perishable material or make the material more convenient for transport. The freeze-drying process works by exposing a material that has been frozen to a vacuum environment. This lowers the vapor pressure of the frozen water contained in the material. Heat will be applied to the environment, driving the water out of the material through the process of sublimation. In order to avoid the liquid phase of the frozen water, it is absolutely essential to lower the partial pressure of water, below the triple point pressure. The triple point is the point where 3 phases - liquid, solid, and vapor - coexist at a particular temperature and pressure. 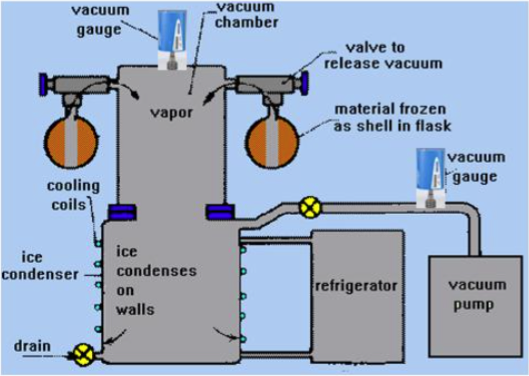 As the water vapor exits the sample, a chilled surface known as the ice condenser collects the vapor from the evolving product capturing it and preventing reabsorption or saturation of the chamber environment. BioPharm manufacturing: Uses lyophilization to preserve products such as vaccines and other injectable drugs (parenterals). The removal of water from these materials allows for the preservation, shipping, and storage of smaller volumes of material. Tablets or wafers are also freeze dried often creating dosage forms which are more rapidly absorbed or more easily administered. Proteins, enzymes, microorganisms, and blood plasma are also examples of materials that are commonly lyophilized. In bioseparation processes, lyophilization is also used as a method to remove solvents that may be too costly or too difficult to remove by other means. FDA requires a higher temperature process manometer to be used in conjunction with a pirani gauge to understand when the “drying” is complete. Food manufacturing: “Freeze-dried” foods help food manufacturers increase product shelf life and allows them to cater to the needs of consumers who are interested in convenience. The foods are typically easier to store and transport due to the removal of water and its associated weight. Foods last longer and can be used in environments outside the norm (e.g. wilderness, military situations, etc.) Common examples are coffee, fruits, and cereals. Once a material has been frozen, the environment in which the material lies is placed under partial vacuum, usually a few millibars. Heat is introduced forcing the frozen water to sublimate thereby exiting the material. That water vapor is often captured on a condensing coil and preventing it from re-entering the freeze dried material. It is important to note that the use of a heated capacitance manometer will prevent the unit from acting as a condenser of the water vapor. In the final step of the process, the vacuum in the chamber is relieved by introducing an inert gas such as nitrogen. This gas regulation may be an area where Brooks Instrument variable area flow meters (rotameters) or MFCs could be supplied. “Downstream” packaging of freeze dried materials often involves “vacuum packaging” which attempts the complete removal of oxygen from the final packaged material. This is important because oxygen is the primary factor in product spoilage. Vacuum packaging may also present opportunities to sell CMX capacitance manometers.